William Henry Harrison was born into a politically prominent family. His father, a three-term governor of Virginia, was one of the signers of the Declaration of Independence. Following three years of college, Harrison’s father sent him to study medicine with a leading physician. Unenthusiastic about medicine, he instead pursued a military career after his father’s death. Harrison distinguished himself in the Battle of Tippecanoe against American Indians led by Shawnee chief Tecumseh-earning the nickname "Old Tippecanoe"-and in the War of 1812. During his Army career, Harrison also served as secretary of the Northwest Territory and governor of the Indiana Territory. He also served in the U.S. Senate, in the U.S. House of Representatives, in the Ohio State Senate, and as U.S. minister to Columbia. In 1840, the Whig Party chose Harrison to run against incumbent President Martin Van Buren. "Tippecanoe and Tyler Too" (future President John Tyler was his vice presidential candidate) was the first slogan used in a presidential campaign. Harrison defeated Van Buren in a landslide, and at 68 years old, became the oldest president to serve in the office up to that point. Former President Harrison served the shortest term in office of any president to date. He died of pneumonia about one month after giving the longest inaugural speech in history. He was the first president to die in office. The US Mint said the dollar coins will begin circulating Thursday and with that, bags and rolls of the circulating coins — minted from either Philadelphia or Denver — will be offered at noon ET through http://usmint.gov/. 2009 Presidential Dollar Proof Sets went on sale last Tuesday for the price of $14.95. I HAVE AN UNOPENED ROLL OF WILLIAM HENRY HARRISON COINS THAT I BOUGHT 2 YEARS AGO IN CORAL GABLES FL. I PAID $25 FOR THE ROLL. SHOULD I HANG ON TO THE ROLL FOR MORE YEARS????? 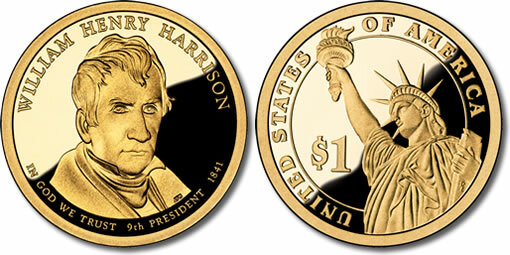 What is the Henry Harrison dollar coin worth now ? I have a William H Harrison Dollar that is silver in color rather than golden. Ever see or hear anything about this? Do you know what the value of the coin is worth today.